I have seen salt boxes in several other places around the blogosphere, and I have been wanting to put one together for QBoy and XGirl. I finally got around to creating our own salt box one recent evening and we have been using it as a tool for learning shapes, colors, letters, and numbers. 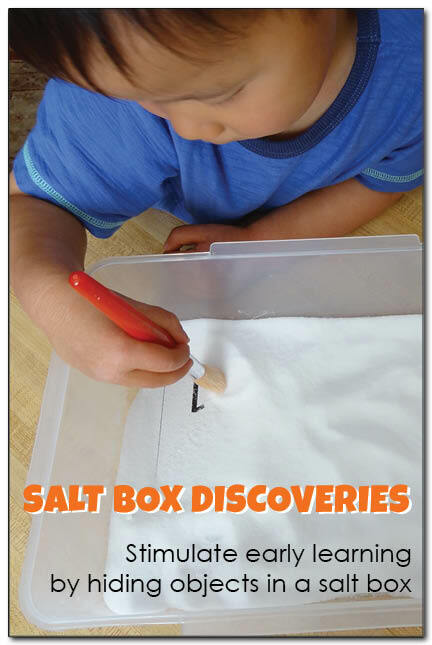 Our salt box was so simple to create, and I’ve really enjoyed watching my kids engage with all the discoveries inside. 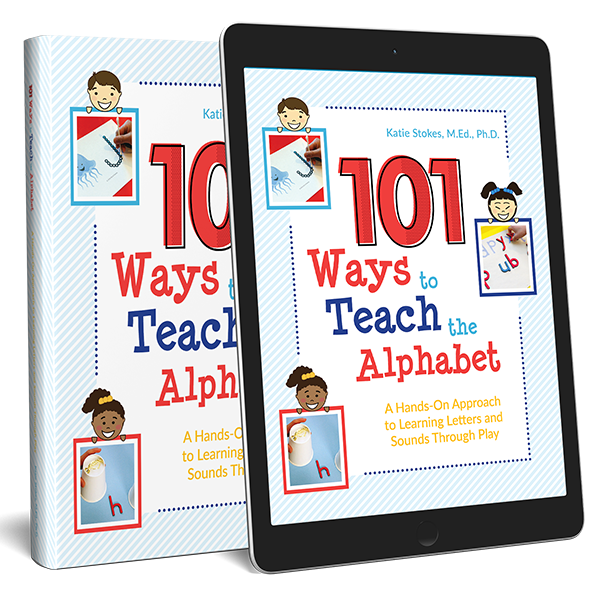 I started by creating several pages designed to target skills such as shapes and colors for XGirl and numbers for QBoy. Then I placed one page at the bottom of the salt box, and covered it with enough salt so that the images were no longer visible. 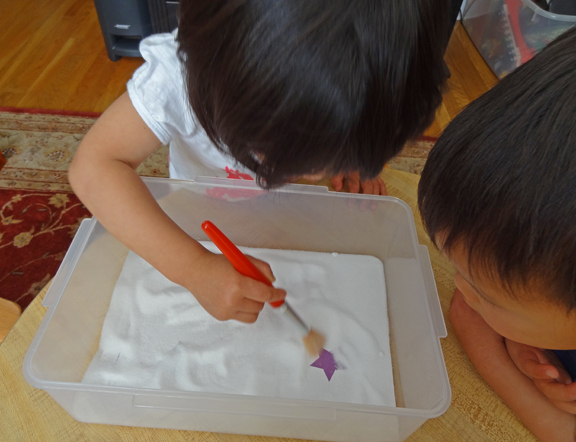 When it was time to play, I handed XGirl a paintbrush and encouraged her to sweep the salt to see what she could find. As she came across a shape, she and I talked about each one. When we adopted XGirl a few months before her third birthday, she was so far behind in so many skills. In the months she has been with our family, she has learned so much, although she still has more catching up to do. Nonetheless, when she was able to successfully identify the triangle, circle, star, and heart, I was one proud mama jumping with joy! QBoy looked on as XGirl worked with the salt box, anxious to get his turn. So after XGirl had found all the shapes on her turn, I switched out the page at the bottom to have QBoy work on identifying the numbers 1 through 5. 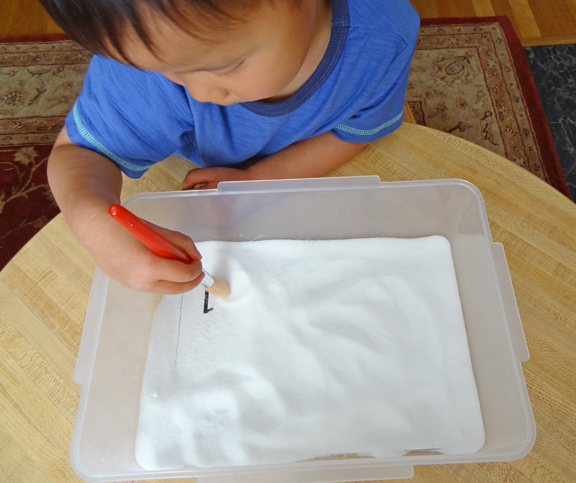 Do you have other creative ideas for using a salt box for learning? If so, leave a note in the comments! Katie, what Idea! You are so creative! 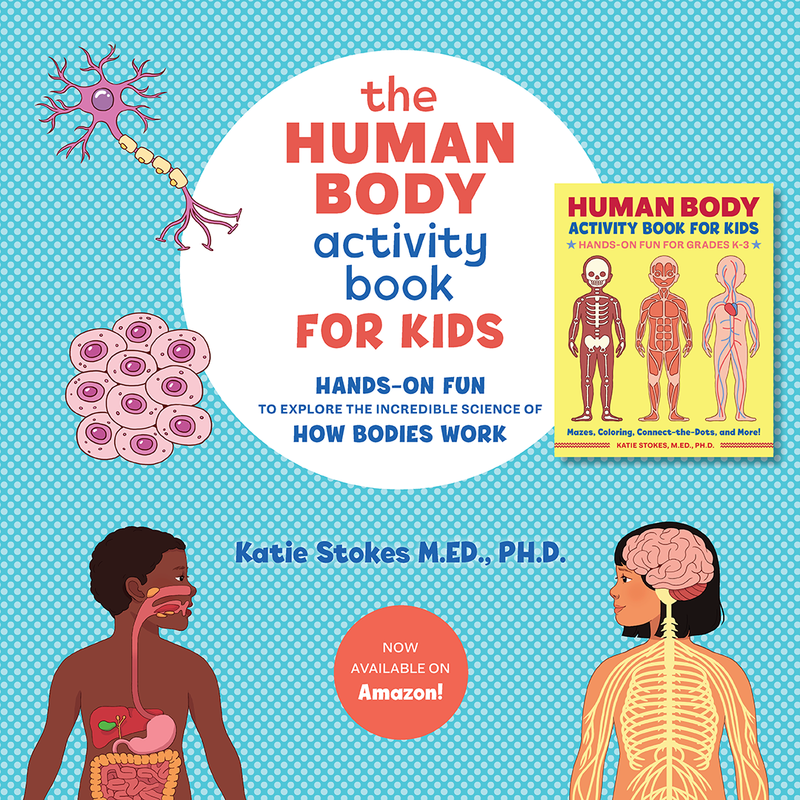 I would like to do it with my preschoolers, can we print the pages? I could not find the download on the web page. Thank you! Julie, I didn’t share the pages because I figured everyone’s salt box would be a different shape, and thus the pages we used wouldn’t necessarily work for others. But it would be easy enough to draw something up by hand if you want to try this out! What a fabulous idea! I love it! Thanks so much for sharing. My kiddos would love this! Hope they have fun with this! Love love love this idea. Thanks for sharing so much!! Can I just say that this is absolutely brilliant and I will be using this in my Montessori program! I will be investigating your page a lot more if this is what you come up with! Well done! Ruth, Montessori 1:1. That is really creative. I’m impressed each week with they ways you find to put a very fun and creative element into teaching preschool skills. Thanks for the invite to your linky party. I added my link! What a great idea! Thanks for sharing on We Made That! Such a fun idea! I’m featuring this on The Sunday Showcase this week. 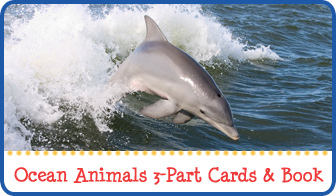 What a fun activity and way to learn! Thank you for sharing at Sharing Saturday!! Thanks for featuring our activity! You could also have them trace the letters and numbers with the paintbrush through the sand. Yes, that’s a good idea. 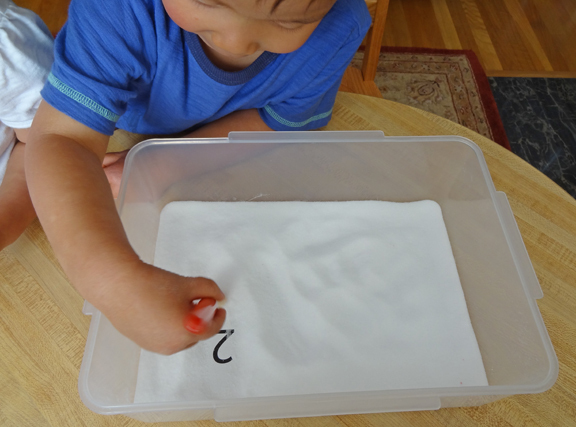 QBoy has used his finger to write letters in a salt tray, but I’ll have to have him try it with a paint brush as well! 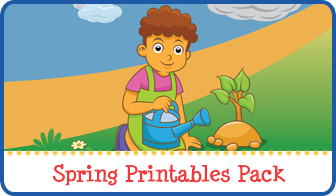 Thanks for linking up with Tender Moments with Toddlers & Preschoolers! We love seeing great ideas, like yours, linking up with us! Great idea. 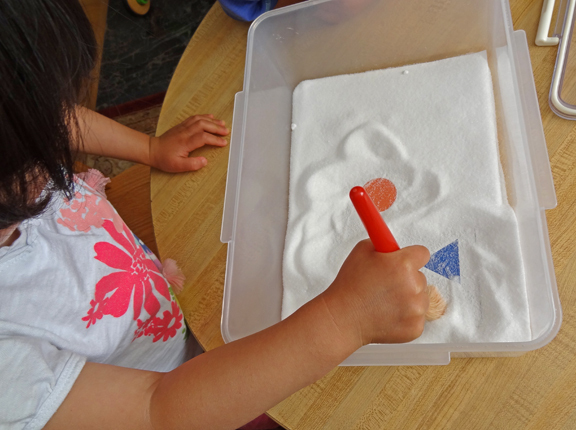 We have one kiddo in particular who can’t get enough of the salt tray, so he would absolutely love this activity!. Thanks for sharing. This is such a wonderful idea! 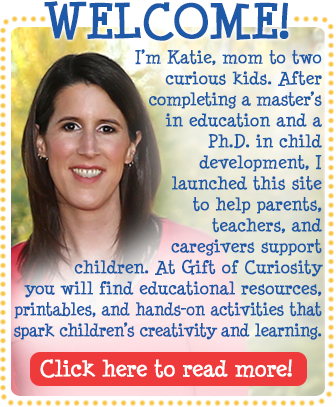 Also, I am loving your new site design!! I am glad Mindy was able to design you a beautiful site! Thanks Angela! I’m so glad I found Mindy through your site, because she was fabulous to work with! I am learning soooo much with your ideas!!! !Than you. Awww, thanks! I’m glad I could inspire!